news Communications Minister Malcolm Turnbull, who has direct responsibility for setting and administering telecommunications law and regulation in Australia, has again refused to clarify whether national broadband company TPG is breaking the law by deploying its own Fibre to the Basement infrastructure in competition with NBN Co, seven months after the move was first revealed. In September last year, TPG flagged plans to deploy so-called fibre to the basement infrastructure to some 500,000 apartments in major Australian capital cities, in a move which will compete directly with the new Coalition Government’s plans to conduct similar rollouts under the Coalition’s Broadband Network (CBN) rollout, formerly known as Labor’s National Broadband Network (NBN) initiative. Shortly after, Optus, Telstra and iiNet confirmed that they were investigating similar options. Although it is illegal for telcos to deploy infrastructure which competes directly with NBN Co’s rollout, under legislation enacted by the previous Labor Federal Government, the telcos are taking advantage of a loophole in the law which allows extensions of a certain length to existing infrastructure. All of the telcos mentioned have existing fibre infrastructure in many areas in major cities. NBN Co executive chairman Ziggy Switkowski told the NBN Senate Select Committee in mid-March that the FTTB rollout plans had the potential to have a “quite severe” impact on NBN Co’s finances, causing a revenue hit of up to 10 percent. In late March, TPG revealed it had already started deploying the FTTB infrastructure. Over the past seven months since the plans were first revealed, and despite the fact that the TPG FTTB rollout has begun and that as Communications Minister he has direct responsibility for setting and administering telecommunications law in Australia, Turnbull has repeatedly refused to say whether TPG’s rollout breaks the law or not. Shortly after the FTTB plans were revealed, Turnbull appeared to call the legality of the planned FTTB rollouts into question, adding that the issue would be examined by the Panel of Experts conducting a cost/benefit analysis of broadband and associated regulation (the Vertigan Review). The review is not expected to be delivered until later this year. In an interview on the ABC’s Lateline program last week (we recommend you click here to watch the full program; there is also a transcript), the Minister again refused to directly say whether TPG’s rollout breached the law. Asked directly about the issue by host Tony Jones, Turnbull appeared to take contradictory positions without coming to a final conclusion on the topic. Despite Turnbull’s comments, it is very clear what TPG intends to do with its rollout. Courtesy of its existing PIPE Networks business, TPG has extensive fibre infrastructure in built-up areas of major capital cities throughout Australia. In its briefing documents issued in September 2013, the company said it would be “leveraging and expanding our existing fibre network” to deploy “fibre to the building” in Sydney, Melbourne, Brisbane, Adelaide and Perth. The ISP has “500k units currently in design”. In late March the company said its FTTB rollout was “progressing”, with the construction phase in progress in Sydney (Pyrmont, Ultimo and the Sydney CBD), Melbourne (Southbank, the Docklands and the Melbourne CBD) and Brisbane (Fortitude Valley and the Brisbane CBD). TPG had already signed up live trial customers, the company said. TPG noted in its briefing documents last year that it would be offering up to 100Mbps packages including “unlimited” downloads and home phone line rental, as well as a bundled Wi-Fi modem and unlimited local calls and “standard” national calls to landlines, for $69.99 per month. If you are interested in the NBN issue at all, and I know that many Delimiter readers are, then I highly recommend you watch the Lateline interview with Turnbull last week. I considered it simply extraordinary. The Minister appeared to take several contradictory points in the same interview with respect to the TPG situation, pointing out both that Labor’s NBN was designed as monopoly infrastructure which needed to be protected against precisely the kind of cherry picking which TPG is proposing, as well as highlighting Turnbull’s own personal view that infrastructure-based competition is a good thing in the telecommunications sector. As has been highlighted several times before, Turnbull is in something of a bind on this one, with powerful forces pushing him both ways. On the one hand, there is the need to maintain NBN Co’s financial viability. Despite Turnbull stating on Lateline that the NBN project is “not a commercial project”, it is very much apparent that the Coalition Government needs to maintain it as such, or risk the money that it is investing in NBN Co coming home to roost on its balance sheet. NBN Co also needs to maintain its commercial nature in order to pursue its cross-subsidy model, where profitable city dwellers subsidise infrastructure in the bush. This is a very serious issue for the Government. On the other hand, of course, and as I have pointed out, TPG’s FTTB rollout is very real, it is here now, and customers are being signed up. Turnbull has personally stated many times that he is in favour of private sector investment in the telco industry, and it remains true that TPG’s rollout (and, potentially those of Telstra, Optus and iiNet) will deliver faster broadband to many Australians in city areas quicker than NBN Co will be able to. It would be highly unsightly for a Coalition Communications Minister to block private sector telco infrastructure rollouts to protect a government monopoly. There are no good answers here for Turnbull, which is why he is dithering in the middle of both arguments, taking up neither for the time being. Either approving or denying TPG’s FTTB rollout will have serious consequences for the government. And what’s more, time is also a factor. TPG’s rollout is now going ahead, and you can bet that Telstra, Optus and iiNet are prepping their own rollouts. The industry is moving ahead on this issue and will, I suspect, shortly take this choice away from Turnbull. And of course, it is ultimately all Turnbull’s fault: This situation would not have come to pass if the Coalition had not started drastically modifying Labor’s NBN policy. The extraordinary thing about all this, however, is not that we’re seeing a Minister dither between two courses of action. That happens regularly in Government. The extraordinary thing is that Turnbull, supposedly Australia’s highest authority on communications law, appears completely unable to interpret that law and deliver a precise judgement on whether what TPG is already doing is legal or not. Let me state this baldly: Minister Turnbull has had seven months — seven months! — to decide whether TPG’s FTTB rollout is legal or not. He has the resources of a huge government department and other departments such as the Attorney-General’s Department behind him to help him with that task, as well as regulators such as the ACCC. And yet he still appears unable to decide what his view is on the situation. It is simply unbelievable that Australia’s highest authority on communications law is refusing to say whether a major network rollout already happening is illegal or not. I wrote last week that it feels like everything to do with NBN Co could turn on a dime, depending on what Turnbull ate for breakfast on a certain morning. Well, we are certainly seeing that here. It is the job of Ministers to regulate industries they are responsible for, as well as interpreting and setting the law in their area. If the Earl of Wentworth can do neither, as the TPG example very squarely demonstrates, then perhaps he had better reconsider his position as a Minister. At least Richard Alston was a luddite, it prevented him from making gigantic errors. Malcolm Turnbull knows enough to be dangerous. And he’s being about as dangerous to Australia’s “information economy” future as he possibly could. I’ve seen a couple of times in my personal experience where a bad decision is better than no decision. At least a bad decision provides some direction, let’s people know where they stand. No decision leaves everyone spinning on the spot, unable to make any progress unless, like TPG, they’re willing to take a pretty big risk. MT seems very happy to make decisions on things like the MTM CBN rollout without waiting for the cost-benefits analysis to be finalised, but on this issue he’s sitting still and silent, perched on the fence. On the fence is no position for a Minister in regards to his own portfolio. P.S. Love the image, looks like he’s getting some more policies ready. Only a judge can rule if something is illegal, anything else if just opinion. It’s not quite that simple … if a Minister says something is illegal, based on Government research then you would very much assume that it was — or that if he was wrong, that the Minister would have the power to change the situation. Sure, it can be tested in court, but the Government sets the underlying framework. Until it is tested, you would assume the Government’s view is the correct one. That’s like Scott Morrison saying people arriving by boat are illegal immigrants, I wouldn’t assume that’s correct. I’d be wary of anything of the government says as being ‘correct’. What I believe is that anything less than FTTN is gross waste of our money & any competition should be welcomed. No, its like the tax office auditing you, and saying you cant claim something. The first decision isnt made by the court, its made by a public servant representing the Commissioner. You’re entitled to object to the decision, and ultimately take it through the courts, but it starts with someone sitting behind a desk and interpreting law. All the courts will do is confirm or reject the decision, but the first enforcement of law will have already happened. And at the end of the day, the Minister is the ultimate representative for the laws he overseas, so as Renai says, would be in the best place to identify the intent behind a law. This day and age, intent is as important, if not more important, than the letter of the law. If the intention behind the law being discussed here is to stop cherry picking, then thats where the interpretation ends up. If the intent is to allow ISP’s to leverage off their existing assets, then the interpretation is different. Which is it? As I understand it, its the second one so ISP’s arent backed into a non-investing position by default. I’m just surprised none of them tried this before, they would all have existing technology near enough to most built up areas that the stretch would be within the margins. That infrastructue includes trunk lines from memory, which go down most primary and secondary roads..
That should be anything less than FTTP is a gross waste of our money. NBN should be a service not a business. The profits to be made are what it provides to the people ( measured in bandwidth ) not the dollars it recoups from what it charges. NBN can still be a monopoly by undercutting all ISP’s anyway. Turnbull’s view has been entirely wrong throughout this whole debacle. “NBN should be a service not a business” — while I agree with what you write, why cant it be both? If its a business at a wholesale level, its not there to made a profit, its there to provide a platform, and hence be both a service and a business. Its when it gets into the retail sector that things can go wrong, and that involves competition and pleasing shareholders. Both big negatives for a wholesale based product. People get caught up in Government monopolies, but federal infrastructure always needs some level of Government control, so it ends up being monopolistic in nature anyway. When Optus entered the fray in the 90’s, there was so much control that they essentially had little room to move anyway. Rupert Murdoch as Mr Burns : (Mr Burns’ film (MTM) is being booed by the audience) Smithers, are they booing me? Malcolm Turnbull as Smithers : Uh, no, they’re saying “Boo-urns, Boo-urns”. Ziggy Switkowski as Hans Moleman : I was saying “Boo-urns”! Peta Credlin as Homer: OK, boy, I wrote down exactly what to say. Just read it and you’re a shoo-in! Tony Abbott as Bart: Hello, Mr. …Kurns. I bad want…money now. Keep the pressure on TPG, I like to watch the man in the suit squirm. Haha oh thanks now I can’t look at it the same anymore! Because a previous government, of which you were a part, sold Telstra and in doing so created a big privately-owned monopoly which has been screwing over the industry and the country ever since. Malcolm should just come out and say its legal, the law that Conroy introduced should be wiped out as anti-competitive, and if TPG took it to hte High Court, I think they’d agree. Competition is better for consumers. Competition is good for the consumer but I don’t think infrastructure competition of the kind is any good other than getting it to people in MDU faster as it would be impossible to have more than one node in then building and will be more often than not who can get there first. If they don’t wholesale it out which accc can’t force them too you will be stuck with who ever gear is there. As TPG are showing good prices now who know they will keep those good prices as we have seen with the HFC they have charged what they like for the internet. I watched Turnbull on Lateline last week being interviewed by Tony Jones and was appalled by the latitude Turnbull as given. That was compounded, the next day, by Ziggy Switkowski being interviewed on ABC 774 Mel by Ali Moore. She was not on top of the subject abd allowed Zig to spin the coalition story. I wasted some minuites of my time and wrote to the ABC but expect no change. They seem to let the NBN ball go through to the keeper every time. I thought Tony did a decent job. He knows the NBN project well. Sorry but Tony let key points in the NBN debate go through to the keeper such as the Mal’s decision for the MTM to move forward without the CBA – a clear smack in the face for Australia with the irony fish – and only really reported by ABC Online today. And that 3 top execs within NBNCo. had packed in the towel – 2 redundancies and a replacement with a Technology Governance model that could be described as a little unusual. The really disappointing thing was that these events occurred or where very relevant news on the same day as the interview. But no, we had to drivel on about Bob Carr’s missive and act like we were insider-qualified to pass (wind) judgement on it. + 10 for the mid-blink screenshot. If I hear Malcolm Turnbull say ‘Let’s be clear about this’ and then proceed to obfuscate and spin BS one more time then some ones or some things life may be in jeopardy. As I watched the Turnbull Lateline Interview I kept thinking of Renai’s heartfelt article from last week. I must admit I’ve had something of a soft spot for Turnbull as pollies go. I admire his elloquence, and I consider myself to hold views closer to his (public ones anyway) on most issues: being something of a fiscally conservative leftie. But …. every one of his tricks was on display in that interview. In the first part of the interview about the proposed changes to the racial discrimiation act, Turnbull made all sorts of inferences suggeting he was totally against the Brandis “right to be a biggot” changes, but when Jones picked him up on his lack of a simple *definitive* statement affirming this, Turnbull explained (roughly) “we’ll make that decision as a cabinet”. His use of non-commital language was incredible: we knew exactly what he was “saying”, without him explicitly saying it. And he put the rider on at the end to make it clear that even if people don’t agree with “his” final position – that’s not his personal view, it’s the majority of the others in the cabinet. 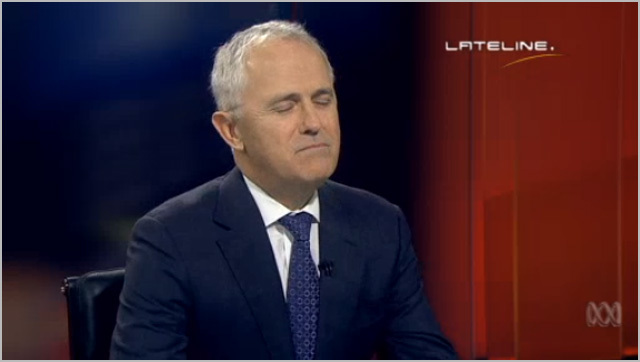 When the interview turned to the NBN, Turnbull obsfurscated his way through the TPG issue. He neither confirmed nor denied Switkowski’s comments despite Jones pressing him on it. I think there is a good reason for this. Having read the legislation it’s pretty obvious TPG are perfectly within the letter of the law in what they are planning, even if they are in complete breach of the spirit. (That’s only possible BTW because an FTTB overbuilt of an FTTH network is ludicrous – even without the FTTH build decommisioning the copper FTTB needs). The government *may* need to legislate to protect the MTM NBN monopoly, because it will be exposed to comparable or more likely superior overbuilds. The extent to which is probably dependant on the deal it does with Telstra, because if the government buy’s the CAN outright it may well be able to block or even terminate TPG type rollouts without legislation. When the subject turned to the even shakier ground of the MTM, Turnbull started attacking the ALP and the whole NBN concept. I think Jones nailed him with “if you could just contain your enthusiasm for the project for just a minute”, but it didn’t change things at all. In recent months Turnbull has been increasingly going on the counter attack like this, presumably because he’s increasingly got nowhere else to go. Turnbull says a lot of very reasonable things that most reasonable people would agree with. But that doesn’t mean he actually holds those views himself, would necessarily support them not matter how popoular they are, or they would be supported by the government of which he’s a member. He’s very good at telling people what they want to hear, without commiting himself. Personally, I don’t think Turnbull *has* been all that inconsistent in his position on the NBN. He’s criticised it in every way imaginable while in opposition – and even while in government. But the Coalition’s policy has been unfaltering since it’s announcement: they are going to cut whatever corners they can to get the NBN “finished” and (presumably) get it out of their hair ASAP. Notice how Turnbull never answers the privatisation question directly? It’s always the Wyatt Roy joke. It will be very interesting to see what the Vertican Review does come up with. While they are all “light regulation, free enterprise” fellow travellers, I don’t know they are quite the lackies who have been appointed to NBNCo directly, and I can’t see any of them compromising their reputations recommending NBN extend it’s monopoly gouging to shore up the government’s budgetary position.